Exclusive and unique Bridal Jewellery UK designed and made by Basia Zarzycka in her London Studio. 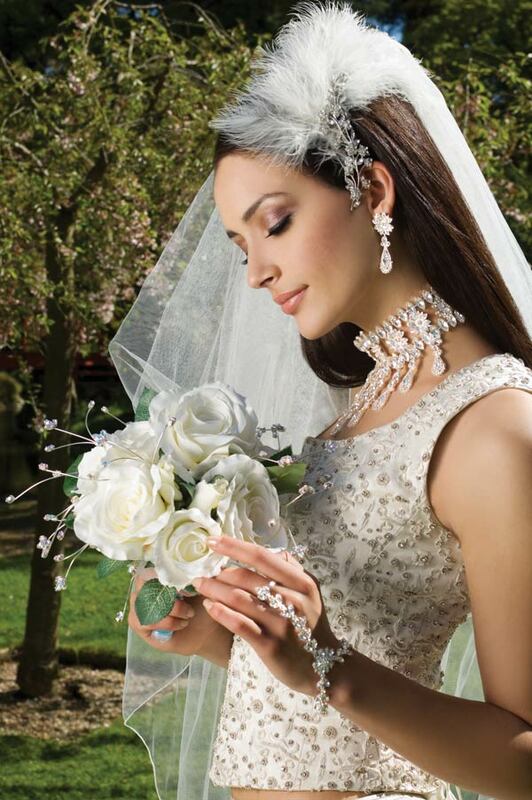 Bridal jewellery, to be worn on your wedding day is one of the most important decisions you will have to make. Sometimes the jewellery chosen can be as important as your wedding gown, enhancing a very simple wedding dress to look stunning when adorned with an amazing paste brooch or diamante buckle and buttons. I fantasise about bridal jewellery all day long. A chandelier pair of earrings and a crystal bracelet or cuff can be an amazing accessory to your wedding gown. I love all the earrings in my shop here in Chelsea, London, and wanted to share with my brides, my very special collection of unique wedding jewellery which includes, earrings, beautiful studs, necklaces, pendants and a most fantastic collection of paste crystal brooches to adorn wedding gowns. Unique Bridal Jewellery UK made by Basia Zarzycka is perfect for the bride who is looking for something special and truly personal for her wedding day. Beautiful wedding jewellery is an area for which Basia is particularly renowned and her bridal jewellery collections deserve to be as equally praised as her fantasy couture wedding dresses are for their inventiveness and design. By choosing one of her signature pieces, you will not only enhance and add the finishing touches to your wedding dress; you will also add a magical extra dimension to your day. Using pieces from her personal collection, including fabulous vintage and antique treasures, Basia creates unique wedding jewellery that is highly unique. The pieces then become new and contemporary, whilst still retaining their original quality. If you are looking for a gorgeous necklace that will look totally stunning against your beautiful dress neckline, a pair of pretty earrings to help to frame your face, or even a bridal bracelet to elegantly complement your outfit, the beautiful designs that come from Basia’s studio will exceed your expectations in every way. Basia Zarzycka’s beautiful costume jewellery is made using carefully selected materials that include real and faux pearls, the finest Swarovski crystals, Bohemian glass beads, and semi-precious stones set in gold or silver with rhodium plating. Matching earrings, bracelets, and necklaces are available to order to complete a perfect outfit. Mothers of the bride and bridesmaids will all be able to find something suitable within Basia’s extensive collection of bridal jewellery. The ultimate unique wedding jewellery for women of all ages can be found here. "I just wanted to tell you that I received my bridal jewellery yesterday, it's absolutely gorgeous!!! I actually cried when I opened the boxes!!! My friend who is getting married in August loved them so much that I've given her your web address. Thank you so very much, I can't wait to wear them"